Celtic Anglian Water (CAW) is a water solutions company who provide treatment services across Ireland. Part of the Anglian Water Group are regarded as one of Ireland’s largest water service operators, CAW employees work across a range of offices and treatment plants across Ireland and the UK. 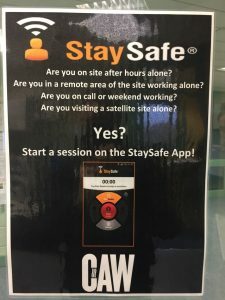 With measures in place to minimise the requirement for lone working, some elements of work still require employees to attend sites alone, CAW launched the StaySafe app to ensure their lone workers are protected even out of hours. Why did Celtic Water launch StaySafe? Before launching the StaySafe app, CAW had implemented a buddy system which relied on lone workers to inform Plant managers when their shifts had ended or they had completed the work and left the site. This method proved difficult for the company to monitor and relied heavily on the lone workers to communicate to the plant manager with no reminders to do so. CAW identified an opportunity to improve this process and turned to technology to provide a solution. This lead to CAW trialling a range of lone worker safety solutions. After trialling the StaySafe app and monitoring Hub, they found StaySafe to be the most accessible, user-friendly and cost-effective tool for their lone working staff. CAW launched StaySafe to monitor their lone workers during later shifts when a plant manager is likely to be absent from site. Even in remote locations, staff are able to begin and end their lone working sessions in the app using a signal level as low as 2G. Once they have checked-in, the whereabouts of workers currently on site is immediately visible within the online StaySafe Hub. CAW employees are monitored by one of our monitoring partners. Any alert that is triggered on the app, goes through to their monitoring station along with an accurate location – allowing them to respond effectively. Outsourced monitoring provides peace of mind to CAW, particularly for out of hours working when internal monitoring previously proved difficult. The business also has access to their own Hub where they can run reports, manage usage and keep an accurate audit trail. “Our lone workers have commended the app for its easy-to-use functionality and efficient and quick set up. Our workers out in the field now feel reassured that they will receive help should they ever require it even in remote areas or while working out of hours. With the ability to set up check-in intervals, which we have set for every half hour, we are immediately alerted if an employee fails to check-in and we can send them the appropriate assistance. Padraic Dolan, HSEQ Manager at Celtic Water. Barwon Water launch StaySafe for a more robust and unified lone worker solution.